Dude ranches are a great setting for corporate retreats, meetings and team building, whether you're a small business, group of executives or larger corporation. Different ranches focus on varied activities to help colleagues excel as leaders and gel as workmates, ranging from the equestrian–– team penning, horseback riding, horse communication sessions and cattle drives–– to non-horsey outdoor adventures–– ropes courses, fishing, yoga, and survival skills. Working together during a cattle drive at The Hideout Lodge & Guest Ranch in Wyoming. 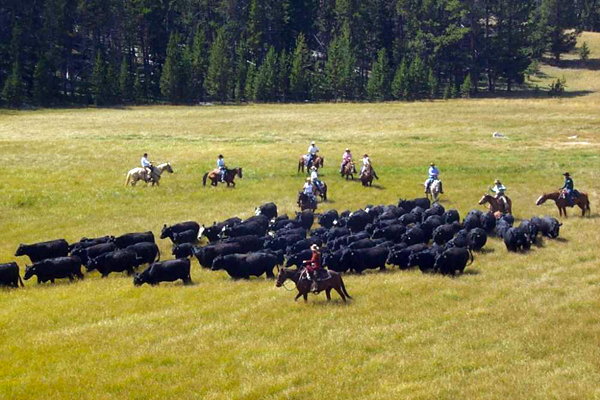 C Lazy U Ranch's cattle drives are a great team building exercise for company retreats. There are a variety of ranches across the USA that specialize in creating great environments for creativity, inspiration and team growth, including an Out of the Square Experience. One advantage of booking a ranch for a corporate retreat is that the setting puts everyone together with fewer distractions. It's also a more focused location for socializing. Because many ranches are all-inclusive, this can also make them budget friendly. The staff's experience and setting can take out some of the planning hassle. 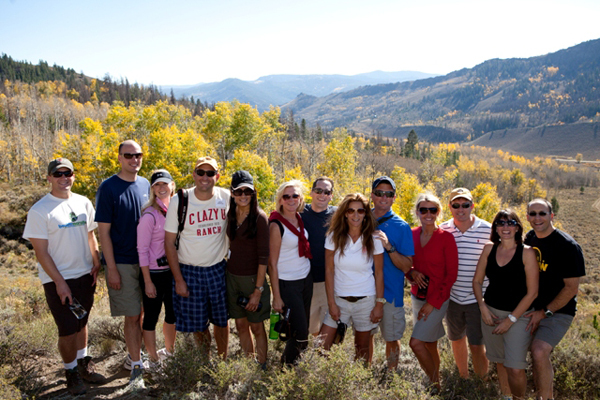 A group retreat at C Lazy U Ranch in Colorado. Below are five great dude ranches that welcome corporate events, retreats, small business groups and groups for team building. They range from upscale to ultra-luxury. For more dude ranches, guest ranches and cattle drives that welcome corporate groups, visit the Equitrekking Vacation Guide and search for Corporate-Groups-Meetings. This Shell, Wyoming working ranch offers a variety of horsey and non-equestrian activities for team building and corporate retreats. Some equestrian activities to promote group cohesion include natural horsemanship clinics, cattle work and cattle drives, team penning and stockmanship, barrel racing and trail riding. This Wyoming ranch also offers 4×4 tours in the mountains, cooking lessons, fly-fishing, archery, hiking, biking, kayaking and more. The Hideout works with groups of up to approximately 30 guests, who stay in tidy log cabins with upscale Western furnishings and decor. For international guests, The Hideout has a staff that speaks five languages, which include French, German, and Dutch. This ranch is also a good pick for groups of foodies, as their chef uses organic, local ingredients for healthy, gourmet dishes. Learn more at The Hideout Lodge & Ranch's website and on their page in the Equitrekking Vacation Guide and Top20Ranches.com. This luxury Montana ranch near Philipsburg in Western Montana offers a variety of corporate retreats and team building activities, all on 6,600 acres of beautiful ranchland. The ranch offers trail riding, arena riding lessons, the art of horse communication class, carriage and wagon rides, and introductory lessons to pole bending and barrel racing. The ranch has 29 accommodations for around 86 guests who can enjoy fly fishing or pistol shooting, among other activities. Indoors, the Silver Dollar Saloon is fully equipped for fun and buisness. The Saloon has a 14-foot HD screen for meeting presentations and a four-lane bowling alley, billiards tables, shuffleboard and other games. A member of Relais & Chateaux, Virtuoso and Andrew Harper Q Club, this ranch is a good pick for a luxury corporeate retreat. Learn more at The Ranch at Rock Creek website and on their page in the Equitrekking Vacation Guide. With a variety of ranch corporate retreats and group team-building events that change with the seasons, this Colorado guest ranch, located two hours from Denver and a half hour from Winter Park, is a good pick for organizations who would like to challenge their colleagues with fun, diverse activities. Some summer, spring and fall adventures include zip lining, horseback riding, group fishing, yoga, camp-outs, mountain biking and archery. In the winter snow, groups enjoy horseback riding, sledding, tubing, snowshoeing, ice-skating, cross country skiing and 24-hour Fitness Center. This ranch also has conference facilities and meeting spaces, equipped with a variety of technology for your business needs. The most popular team building event at C Lazy U is on the ropes course challenge, created to produce a constructive team building environment that carries over into personal growth and development. Groups that want to saddle up may enjoy the Cowboy Ethics, Horsemanship and the Cattle Pushing Clinic. The ranch can accommodate up to 90 guests. Learn more at the C Lazy U website and on their page in the Equitrekking Vacation Guide and Top20Ranches.com. This luxury Colorado guest ranch just north of Steamboat Springs offers year-round Western Team Building Activities and Corporate Events tailored to a range of activities and skill levels, including specific leadership based activities. Some team building adventures may include team penning and cattle drives, ranch work with a team building focus, winter survival skills, rock climbing and orienteering through the forest. Vista Verde can accommodate up to 40 guests. Learn more at the Vista Verde Ranch website and on their page in the Equitrekking Vacation Guide. This Wickenburg, Arizona dude ranch located 75 Miles from Phoenix Sky Harbor International Airport is able to host large events with modern meeting spaces, as well as create fun team building activities both on and off horseback. A member of the Historic Hotels of America, the Arizona Dude Ranch Association and the Dude Ranchers' Association, this Spanish style ranch, specializes in team penning activities, during which guests learn more about leadership and working together as they attempt to herd steers into the pen in the shortest time. The ranch also arranges customized golf tournaments, desert jeep and ATV tours, and hot air ballooning. The ranch's 79 casitas can accommodate up to 158 guests. Learn more at the Rancho de los Caballeros website and on their page in the Equitrekking Vacation Guide. For more dude ranches, guest ranches and cattle drives that welcome corporate retreats, groups and business meetings, visit the Equitrekking Vacation Guide and search for Corporate-Groups-Meetings.